Over the past few months, leaders from around Fresno, including organizational partners of the picnic, have worked hard to make sustainable changes in Sierra Madre. To celebrate all of the work that has been done, and the work happening in the near future, a free and open to all community picnic is being held on April 15 from 12-3 p.m. 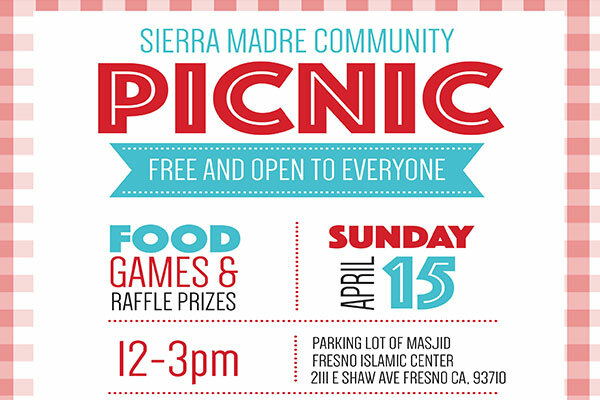 The picnic is held at the parking of the Masjid Fresno Islamic Center at 2111 E Shaw Avenue, in Fresno. Local residents are encouraged to come and enjoy the picnic, in hopes that the annual picnic will increase communication amongst themselves and local residents. The Associated Students, Inc. have been involved in helping revitalize the neighborhoods near campus since 2011 when a non-fatal shooting in Sierra Madre caused fraternity houses in the neighborhood to lobby for change. This event is free, open to the public, and will feature food, games, and raffle prizes! No alcoholic beverage are allowed at any time. This event is made possible by the following partners: Masjid Fresno Islamic Center, Associated Students Inc. at Fresno State, Pi Kappa Alpha Fraternity’s Fresno State chapter, Sigma Nu Fraternity’s Fresno State chapter, City of Fresno Police Department, University Police Department at Fresno State, City of Fresno Councilman Paul Caprioglio’s Office, The Bulldog Fan Zone at Sequoia Textbooks on Shaw avenue, and The Bulldog Pantry. We welcome any to volunteer to help out at the picnic there are many fun games and activities for you to run during the event and you can sign-up any time.